Home » Study: Can Grapeseed Extract Protect Your Heart When Using Anabolic Steroids? New research coming out of Egypt suggests that individuals and athletes that supplement their daily diet with grape seed extract may be able to actually protect their heart, their cardiovascular system, and individual blood vessels from damage that may be caused through anabolic steroid usage. Researchers operating out of the University of Tanta published this information in the Oxidative Medicine and Cellular Longevity publication in early 2019 after conducting research on animals. Four different groups of laboratory rats were prepared for this protocol, and over an eight week block of time researchers provided anywhere between not grapeseed extract whatsoever and a significant amount of grapeseed extract to the rats to see what kind of impact it might have when they were further dosed with anabolic steroids. Unsurprisingly, the group of rats that were given anabolic steroids without any great seed extract were found to have significantly larger musculature – but also had considerably heavier heart enlargement issues as well. This side effect has been linked to a number of different anabolic steroids, but is especially common with the steroid boldenone. Researchers found that the most significant amount of heart enlargement was found in the left ventricle, the ventricle responsible for the “heavy lifting” of pumping oxygen rich blood back into the body. The heart was found to have atrophied because it was forced to work a lot harder than it would have had otherwise, a side effect of these anabolic steroids. 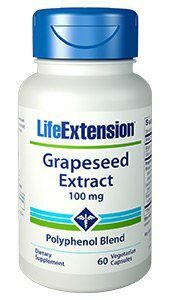 Interestingly enough, researchers found that the laboratory rats provided with grape seed extract suffered from almost none of these negative impacts. Instead, they had healthy hearts that were operating the way they should have been in the first place with no extra enlargement or abnormality found. Top of that, researchers found that the laboratory rats being dosed with grape seed extract alongside of anabolic steroids produced much fewer NOX enzymes in the body. These enzymes are known to produce free radicals throughout the blood, attacking immune systems, and leading to all kinds of significant health risks and problems that can prop up later down the line – in humans as well as laboratory rats. At the end of the day, researchers out of Egypt are very excited about the potential that grape seed extract may have in helping people that are choosing to use anabolic steroids at the very least lower their potential risks of some serious side effects cropping up later down the line. The dosage in relation to what humans would have had to receive to see these kinds of impacts was considerably higher than most people would ever take in a traditional setting, and more research is necessary to fully understand what kind of impact that this amount of grape seed extract would have on human physiology and if it would have the same kind of beneficial impact for those that are choosing to take advantage of anywhere between 400 and 600 mg of Equipoise (Boldenone).